Evolve is just a few weeks away, and up until yesterday it was pretty unanimously agreed that it was looking really hot. 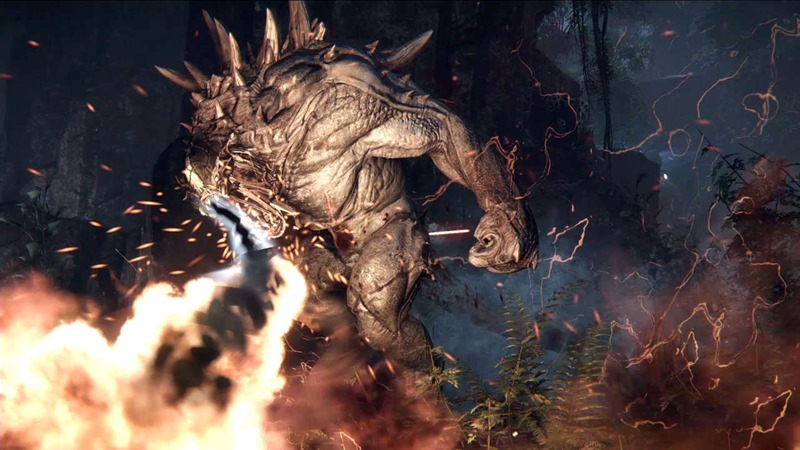 That perception changed for a few after Turtle Rock detailed their extensive DLC plans for the game, which will charge players for new monsters, hunters and skin in the future. There was outrage, but Turtle Rock maintains that it’s fair. Responding to comments from fans on the games official forums, co-founder of Turtle Rock Studios Phil Robb maintains that their isn’t on-disc, locked content, and that it’s all still a work in progress. Robb also wanted to remind everyone (again) that not purchasing DLC wouldn’t lock you out of games. Players who purchase DLC will be able to access it, but Evolve won’t boot you from a server just because it’s sporting a monster you don’t personally own. It’s curious that fans have only picked up on Evolve’s DLC plans now, considering Turtle Rock has been relatively open about their roadmap for a few months now. The idea was always to sustain Evolve with constant DLC content, in order to keep the game fresh and returning fans hungry for more. That much was told to me last year at a hands-on event, and Turtle Rock has never tried to hide it. Still, I can understand where some of the anger stems from. It’s a full priced, multiplayer focused game at the end of the day, which itself is a rarity. Asking fans to fork out for more might be the best way to keep Evolve alive content-wise, but it could lead to the game falling out of mass favour in the same way Titanfall did. Do you think some of this content should be free?